Will you trade in the family cow for magic beans or defeat the giant who is hell-bent on destroying you. 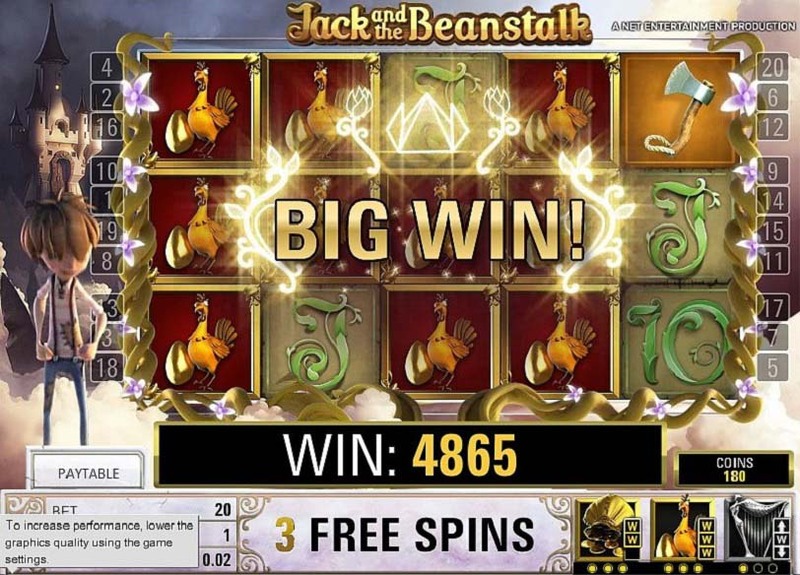 In this contemporary take on Jack and the Beanstalk, this 5 reel new online slots game is destined to get your nostalgic juices flowing when you uncover the mystical Walking Wilds and Free Spin bonuses. The figures surrounding NetEnt’s operation in the online casino market are immense. Billions of transactions every year, at nearly 200 online casino operators, across more than 200 thrilling games. And with NetEnt growing every year since the mid-90’s, they become a stronger force in the market from day by day – and deliver the games that back up their status. If you'd like to discover more about the NetEnt game range then play today. Jack and the Beanstalk is a title the majority of us will be familiar with. It is the story of a boy who took a chance, and found his way to magical wonders – and we’ll be hoping for the same when we take a spin with NetEnt’s fantasy-themed 5-reel, 20 pay line online slot. From £0.20 to £100.00, we can see what giant wonders await us at the top of the Beanstalk. 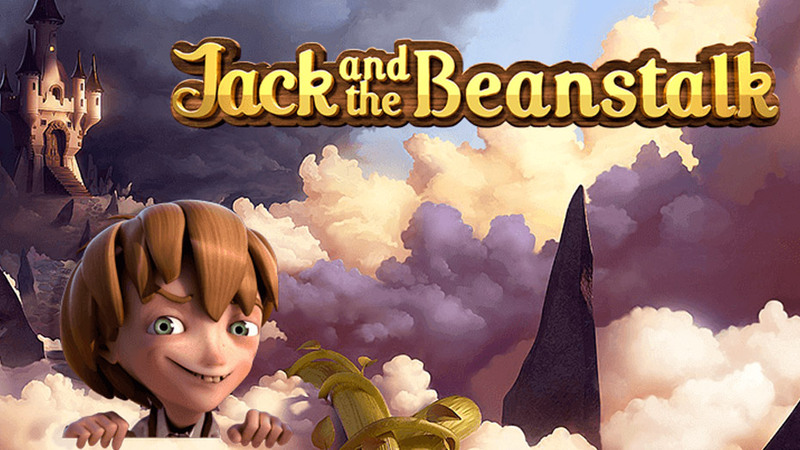 Jack and the Beanstalk features all the charm we’d expect in a NetEnt title. The graphics are of a high detail, with quirky, fun characters aplenty and a great environment in which to spin. We sit at the foot of the Beanstalk, with Jack’s house on one side, and the massive trunk of the Beanstalk itself on the other. A range of playing cards, each one in the form of the twisted beanstalk, is the lower value symbols of the game, and appear alongside several pictorial symbols. A Watering Can, an Axe, a Goat, a duo of angry, Purple Giants, and plucky Jack himself are the higher value symbols. 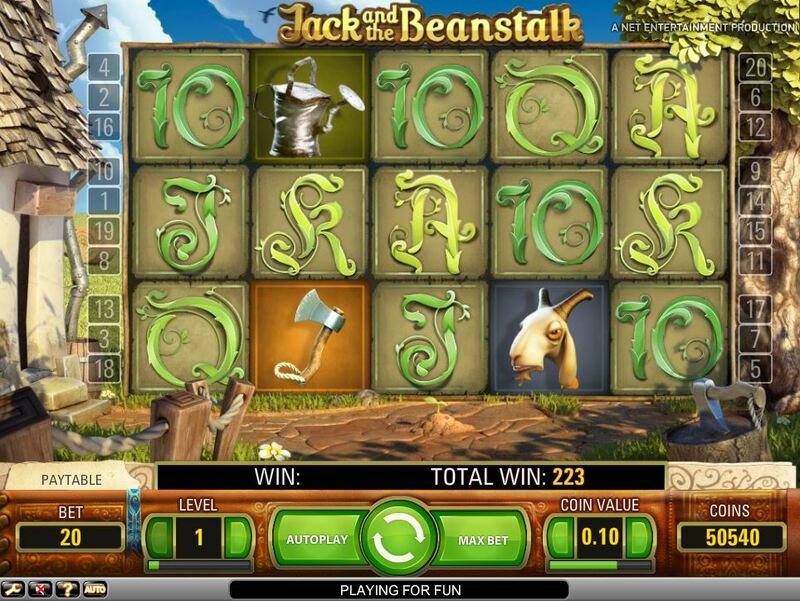 There is also a Scatter Treasure Chest, and the Jack and the Beanstalk Wild, both of which increase our chances of landing the 1500-coin Jackpot. There is also a Walking Wild Feature, which appears randomly in the base game. A Walking Wild symbol will automatically trigger a Free Re-Spin, which will continue until the Walking Wild has made its way to the left of the reels. Three of the Treasure Chest symbols will trigger the regular Free Spins feature, with an initial 10 Free Spins coming our way. Each Re-Spin Feature comes with a 3x multiplier on all wins and can be retriggered a small number of times. During the Re-Spins feature, Key Symbols will appear on reel 5. If we manage to collect 3 keys, the next Wild to appear on the reels will become a Stacked Wild of Money-Bags. If this happens again, the Stacked Wild will be Golden Hens, and if this happens a third time, a trio of Golden Harps. The Stacks will also move one step to the left with each spin, like the Walking Wilds, triggering massive wins along the way. NetEnt always manages to put a new spin on an old classic, and they’ve done it again with Jack and the Beanstalk. The Walking Wilds feature has the feel of the Giants stomping across the clouds, and the detail of the cartoonish graphics is really apparent in the character of each symbol – Jack does seem like he could outwit anybody who lived in a cloud! 9/10 from Dream Jackpot for bringing innovation to an old favourite. 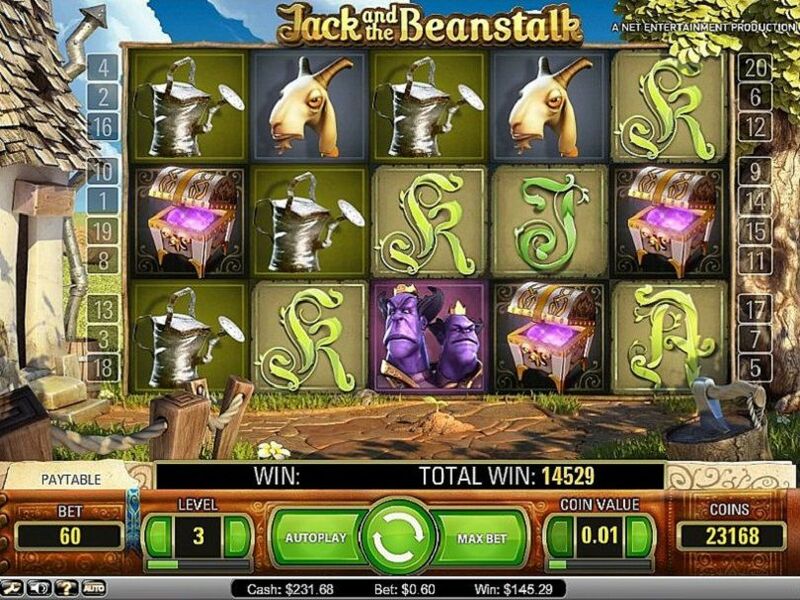 If you enjoyed Jack and the Beanstalk then you might also like Stardust Slots Game.